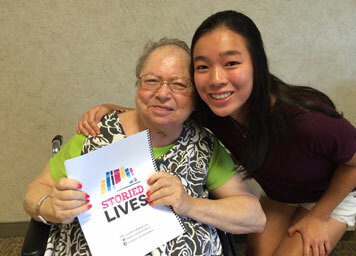 This week’s cool ideas is Storied Lives, which pairs service-minded high-potential students who love to write with the elderly living in residential care homes, who are often lonely and want to tell their stories. Over the course of a program, the students will spend quality time with their assigned elderly person, getting to know them, writing a story about their life, and finally, presenting the story to their resident at the program’s closing ceremony. The program was founded in 2012 in Morris County, NJ, pairing students from West Morris Mendham High School with elderly residents at Morris Hills Center in Morristown, NJ. This story first appeared in our State of Grandfamilies in America: 2015 report. As a line lead for his job in the mobile canning and bottling industry, the farthest Chad Dingle has ever traveled is about five hours from his Oregon home. But, in life, he has traveled more than any 23-year-old should ever have to go. With his mother and father trapped in alcoholism and drug abuse, Dingle spent infancy and his toddler years neglected and abused – memories that only came back in nightmares – until his grandmother could get full custody when he was 3 and she and her newly-wed husband could adopt him when he was 4, diagnosed with something not a lot of people knew about at the time: Post Traumatic Stress Disorder (PTSD). The years of learning how to navigate the complex legal, emotional, financial and physical issues have resulted in three books written to help families in similar situations. In her book, Second Time Around: Help for Grandparents Who Raise their Children’s Kids, Dingle’s mom, Joan, stressed the critical role that quality, professional counseling and support services play in helping grandfamilies succeed and thrive. Together, Dingle and his mom wrote Addiction & Families and the just-released Raising Children of Alcoholics & Drug Users. Today, Dingle still grapples with residual matters. For example, he said he contacted his birth father two years ago and is still trying to figure out whether he wants him in his life. “It’s been a lot,” Dingle reflected. Yet, any miles he travels will now include his wife. “We were high school sweethearts – went to separate high schools and had about five or six years when we hardly ever saw each other,” Dingle said. And, they will include the couple’s baby, expected with great excitement this year. Learn more about Chad Dingle, Joan Callander Dingle and their books. This week’s cool ideas is LIFE - Living (well through) Intergenerational Fitness & Exercise - in Iowa, a program led by younger adults that increases access for at-risk older rural populations to sustainable, low cost, physical activity programming. The LIFE Program is a twenty-four week physical activity program that uses low-impact, moderate activities guided by the exergaming tool, Kinect®, and is intended for physically inactive older adults. The theory-based LIFE program aims to connect the generations, improving aging perceptions in young adult trainers while providing socialization for the older adult participants.